In this, my final post for this years Parish Walk, I'll give you my view, thoughts and feelings on how the day was for me... One thing's for sure, my experience will be different from others who took part and no two walkers will tell you exactly the same story! I woke up just before my alarm went off and got up filled with anticipation. I ran a warm bath and got in to warm my muscles, after that I dried off, applied some Vaseline to areas that may become affected by chaffing and got my kit on. After a nice bowl of porridge, my wife and two daughters got into the car and drove me to the NSC, I was very nervous, but my girls managed to help calm the nerves by telling me how proud they were of me and wished me luck before I got out and made my way towards the NSC Grandstand. I walked about to warm up before stretching and thought it best to make a toilet stop before heading to the start line. I chatted to a few people I knew about their expectations and goals for the day and it gave me some focus on my plan of finishing. I joined the queue a little bit further from the start line than I would have liked, but I was on the outside, so it would be easier to overtake those in front if I chose to do so. The starting pistol went off and the race had begun, I quickly moved up the field and the before I knew it we were leaving the NSC track, my mum (Janet), sister (Jo) and nephew (Thomas) were there to cheer me on which gave me an early boost! I had started very quickly and as I'd been carrying an injury all week, I was worried that the current pace might cause me problems so slowed up a little as I walked along the TT access road. It wasn't long before my friend Liam Parker (#85) had caught up to me, we had been walking at a similar pace during training so it made sense to walk together for as long as it was beneficial to us both. 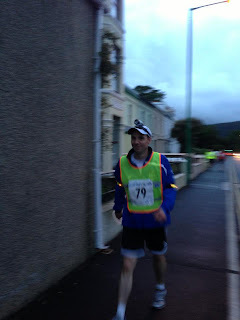 The first part of the course to Rushen went by very quickly and I'd posted PB time to that church. My pace was slowing as I walked up the Ballakillowey Road and Liam seemed to have paced to burn, so as he began to stride out, I wasn't going to try a keep up as this would almost certainly result in me burning myself out to early. As I approached the Sloc, my legs felt heavy and sore, this hadn't happened to me since my first Parish Walk over a decade ago! I was now filled with dread that I might not make it to Peel, let alone back to Douglas Promenade, so decided to make my first toilet stop of the day, fill up with isotonic drink and eat a Mars Bar (other chocolate bars are available), I was given a pep talk by my mum and sister (who were doing my back up) and then started off up the Sloc once again. After about 15 minutes I was feeling better and had more energy, so powered up towards the round table, my first low was a big shock, but from my experience, walkers will always have lows somewhere around the course, but it's mentally dealing with the low points and pushing though that gets you to the finish line. I noticed that the sequence of support cars was reminding me of the background in a Scooby Doo chase scene, as it usually goes something like this "Mirror, Table, Flowers, Grandfather Clock, Mirror, Table, Flowers, Grandfather Clock, Mirror, Table, Flowers, Grandfather Clock", the cars were the always parked up in the same sequence which indicated that the pace I was doing was similar to that of the walkers around me, maybe I hadn't lost as much time as I first thought? I had a strong walk into Peel, where I was met by my wife and daughters, my eldest, Holly was holding a sign saying "GO DADDY #79" and cheering for me! my youngest daughter Lucy was there too and gave me a big smile! I gave them both a hug and then headed off to Kirk Michael feeling like a million dollars. So far, the weather had been really nice, but the clouds started to gather and we saw the first shower of the day, I put my jacket on, but the combination of the wind and rain soaked though the jacket and I was feeling a bit damp. The shower didn't last too long and the sun could once again be seen in the sky so I dried off in no time. I had my girls waiting for me one final time at Kirk Michael (before they went back to Douglas to their Nana's for a sleepover) so I was able to have one final cuddle with them before I headed off into the evening. At this point it's worth mentioning that since walking with Liam, I had not really walked or talked to another walker for longer than about 2 minutes, which I found a bit strange? The weather was bad from Jurby to Bride and the rain had started which began to annoy me. This years race seemed so much harder than the one I'd taken part in 2011. My back up team continued to do a great job of keeping me fuelled with food and drink (as well as some well timed pain killers). As I entered the church at Bride my wife and sister in law, Jennie had joined the back up crew, so I now had more people to help me along the way... how could I not finish?! I must have started taking on more water, because I was starting to lose a fair bit of time on toilet stops, I weighed this up against dehydration and decided that more water was definitely the better option! Walking into Andreas is one of my favourite parts of the race, there always seems to be a great community spirit there, with BBQ's on the go and drinks flowing... the smell was amazing (and the support they showed wasn't bad either). I saw my fellow blogger Tony McNally sitting on a wall in the village with a can of Carling in his hand... I was a bit jealous to be honest but he gave me some encouraging words and I headed off to Lezayre in the knowledge that he would probably prefer to be waling than having a drink at this time (yeah right!). From here to Leyzayre seemed to pass rather quickly (maybe because the rain had stopped and the weather was decent? ), but I could feel the blisters on my right foot getting uncomfortable. Upon touching the gate at Lezayre, the blister under my big toe burst (which was a Parish Walk first for me), I looked down to see a patch of blood on my trainers and thought "never mind that, it's only a bit of blood, get walking lad"! My back up team told me that I was upwards of over 15 minutes on my previous time, but that didn't matter, I really just wanted to finish and if my time was quicker, then it was an added bonus. I arrived in Parliament Square to the sight of my Auntie Susan and Cousin Nadine taking pictures of me and saying that I was making good time (they'd been following my progress on the Manx Telecom timing website). As I headed out of Ramsey towards Maughold I could feel myself slowing due to the blisters on my feet and an intermittent pain I was getting in my left knee. The decent into Maughold was the straw that boke the camels back as far as my knee was concerned, the intermittent pain had turned into a constant stabling pain, this lasted the duration of the decent and eased as I made my way uphill towards the church. It was still relatively light when I arrived at the Church, but darkness fall in the blink of an eye. The moon was shining bright which lit up the road well, but what a long road it was... and boring! My dad joined the back up team and said he's been checking my progress and listening to Manx Radio for the majority of the evening, he confirmed that Michael George has won the race and I was really pleased as Michael had been in contact with me on Facebook and the blog about walking over the last year, giving me tips and encouragement, I knew how much the win would have meant to him and I gave me a lift as I forced my way up the Hibernia and back onto the main road. A number of walkers who'd been quite far behind me had now caught up, my ambition of finishing never wavered, but the chance of beating my previous time of 19 hours and 47 minutes was fading as my pace continued to deteriorate. I chatted with a fellow walker about her day, but the conversation didn't last long as she had lots left to give and walked on ahead, she was certainly not running on empty like me. As I got to the top of Minorca Hill in Laxey, I'd lost a lot of time and ad been passed by quite a few people, but at that point I didn't care, I was just concentrating on putting one foot in front for the other and trying not to think about how long it would take to get to the finish line. I started walking with a woman who I'd had walked and chatted with briefly earlier on in the race, she looked in pain and we agreed that it would probably be beneficial for us both to walk together, she introduced herself as Jane Foster (#35) and had just enough energy for a hand shake. Upon leaving Laxey I felt like I ad a stone in my trainer, so had to stop whilst my wife removed my trainer and blood stained sock to reveal that it wasn't a stone at all, but a blister, I changed the sock and laced up my trainer, but by this time Jane had carried on and I thought that would be the last I saw of her. My eyes were feeling heavy and the rain was really lashing it down. I lost another few places to walkers who were giving it the final push, my friend Paul Corris (#172), who by his own admission had looked shaky at a few points around the course was now powering past me and said "Come on, we can get in under 20 hours if we keep going", my reply was "under 20 hours will be difficult for me, but you should go for it mate", he disappeared off quickly and I turned up to Lonan Church. Jane passed me on her way back to the main road and said "hurry up, I need my walking buddy", I said that I doubted I catch up, but would do my best! After checking in at Lonan, my knee pain had flared up when going down hill. I had support from my sister's friend Clair, who was in her Pyjama's and appeared to be mooning passing walkers to spur them on? I trundled along the road that I'd walked so many times in training and my support crew all seemed concerned that I'd gone very quiet and refused my iPod (which I would never normally do), I tried to keep the smile that I'd had on my face all day going, but it was getting harder to find anything to smile about. The rain had made a river appear in Baldrine and I splashed my way through it like I was Peppa Pig! The decent into Whitebridge saw me speed up a bit and caught Jane as we entered Onchan, I shouted "have you been waiting for me" she laughed and we started discussing the pain we were in, it made me feel better knowing that I wasn't the only feeling dead on my feet. We checked in at Onchan and were not on the home straight, my mother in law, Joyce had joined the back up team to see me finish, which was really good of her... but who was looking after the kids (she assured me that my father in law was on the case and the girls were fine). Every step was agony, even stepping off the pavement was a chore. My support team were great along this road and when I got to the Promenade, they said they'd see me at the finish. The time was 03:40am and getting to the war memorial in 20 minutes would be a big ask. Jane had picked up a groin strain and said that she'd understand if I wanted to go on ahead, I said "What's the point? ", I knew that it was more important to make sure we both got over the line, so we walked at a slow but 'comfortable' pace. There were 2 random people running on the beach, which bemused me as it was too early for someone to be either walking their dog or going for a run surely, this mystery remains just that and I still wonder what they were doing now! A few walkers passed us by in the last 20 yards, but I didn't care, at 04:06am we crossed the finishing line and the ordeal was finally over! I had a foil blanket thrown round me and Emma was told by the St John Ambulance lady to take me straight home and get me dry. Jennie pointed out that I'd not had my picture taken and I thought... I've not walked all this way to get now visual record of me at the finish line, so I shrugged of the foil blanket and put on a smile as Emma cuddled me and we got the official photo. When I got home I was tired and aching, but insisted that I had my photograph taken in my kit with my medal, especially as Emma had taken the photo above of me wen I got out of the car and I looked a mess! Emma had popped home earlier to put the heating on, so the house was nice and warm. She ran a hot bath and made me a couple of bacon baps and a cup of tea... I was in hevan! As I climbed in to bed I hoped that the other walkers who were still out on the course were still in high spirits... I however, was very sleepy, so drifted off quite quickly! I just want to say a big thank you to my great back up team, my mum and sister (who looked after me all day from start to finish), Emma, Jennie & my dad. I wanted to make them all proud of me and hope that I did? Another thank you goes out to all the well wishers who contacted me by text, Facebook, Twitter etc. before/during/after the race, I was amazed at the amount of people who said they were following me throughout the day online. Also, I want to thank my fellow bloggers Tony McNally and David Watterson for the entertaining insights into their training and preparation for this years event... Well done for your achievements! Lastly, I need to thanks anyone who has read this blog over the last six months or so, I hope that it's helped some people or at least made you laugh! Nice one Paul. I really enjoyed the cliff-hanger ending! That knee pain on the downhill sections sounds like an irritation or tightening of the ITB (iliotibial band). It's worth getting it checked by a Physio so that they can loosen it up and make sure it doesn't become an issue for you. Congratulations Paul. It sounds like it was a real slog after Ramsey, so very impressed with the time! Thanks for the blog and have a great summer!